Small it might be, but your garden deserves a visit. You have such a taste to decorate and show us the cheerful blooming. I am never tired to see this charming place. Keep painting and take care. Hello Erin...Everything looks so delightful, bright, colorful and cheery. I love the rug! Is that a Mary Englebreigt design? I love her work. 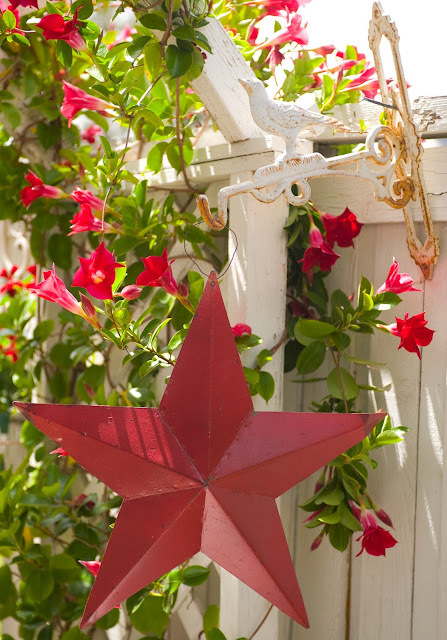 I forgot to ask you how you call the red climbing plant (the photo with the red star)It is lovely. I re-read your Balboa Island posts. The cottages are so charming, framed with flowers of every colors under a bright sun. Enchanting. I dream to live in such a cottage. Have a beautiful and creative sunday. Hi Erin, Happy Memorial Day! I love your patriotic garden. I dearly love your Patriotic Garden! Am waiting for your Patriotic Painting! Hi Erin, your garden is looking beautiful and I love the flags! I hope you have had a lovely Memorial day weekend. What a cheerful patriotic garden! Love all the red, white and blue! Red white and blue are so perfect for your little garden-- what a wonderful patriotic salute-- cottage style. Love everyone of these photos! !